The Southern Plains cover 240,000 square miles. In his Caprock Canyonlads: Journeys into the Heart of the Southern Plains, environmental historian Dan Flores writes: the Southern Plains “have always had recognizable boundaries, the whole forming a giant oval lying east of the Sangre de Cristo range of the southern Rockies.” From the foothills of the southern Rocky Mountains in eastern New Mexico and the far edge of southeastern Colorado, the Southern Plains extend to the 98th meridian where they meet the more hilly and humid Rolling Plains of present day northeast Texas and central Oklahoma. The region reaches north to the farthest edges of present day southwest Kansas, crossing slightly over the Cimarron River while remaining below the Arkansas River. 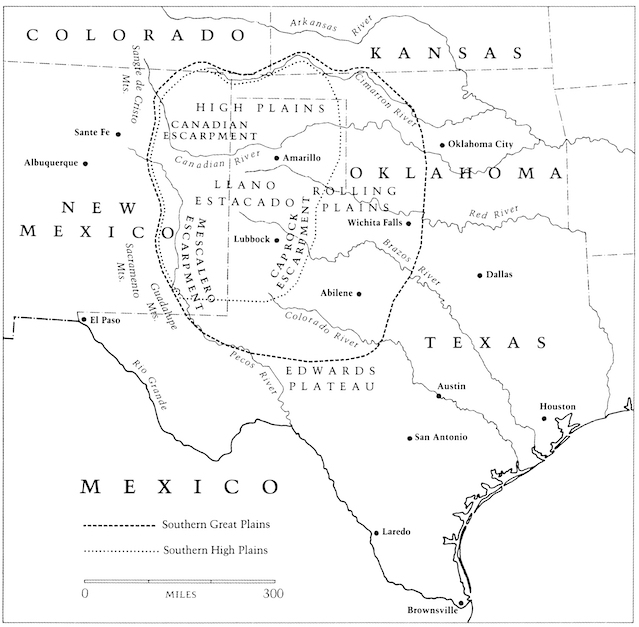 To the south, the plains extend until meeting the Pecos River of far west Texas and the Edwards Plateau. As a whole, the Southern Plains are arid or semiarid, windy, grassy, and flat highlands that are interrupted only by escarpments and canyons at their geographical center. The Southern Plains. Courtesy of Dan Flores, from his book Caprock Canyonlands: Journeys into the Heart of the Southern Plains. 1990. Twentieth Anniversary Edition, College Station: Texas A&M University Press, 2010.